Alaska's cannabis tax revenue dipped in February, tax officials said this week. 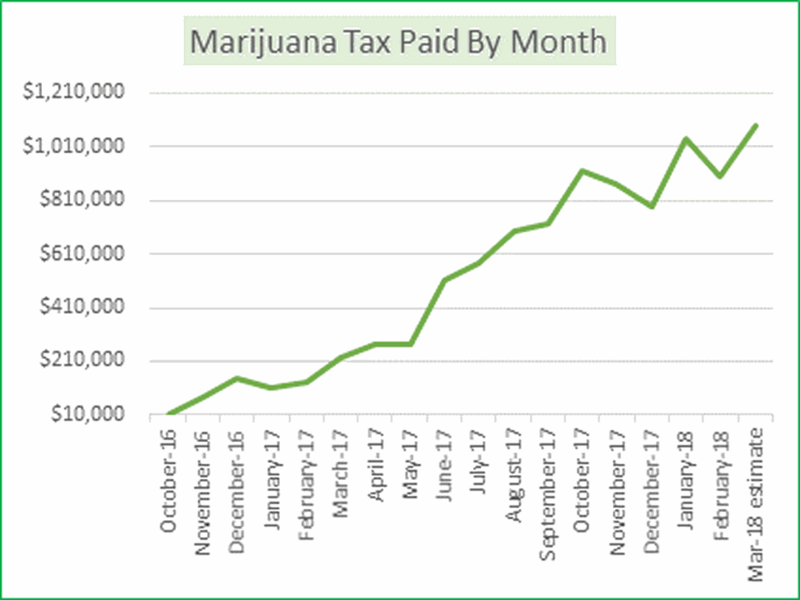 Marijuana growers across Southcentral, Interior and Southeast Alaska paid $897,082 in cannabis excise taxes in February, according to Kelly Mazzei, excise tax supervisor at the Alaska Department of Revenue. Despite February's drop of about 14 percent in tax revenue, the long-term trend shows a continuing increase in marijuana sales, Mazzei said. "The number of cultivators paying the state's marijuana tax has more than tripled in the past year," Mazzei wrote. As the state continues to approve licenses, cannabis growers continue to come online. In February, 87 growers paid taxes. In March 2017, only 27 growers paid taxes. Growers pay a tax of $50 per ounce of cannabis bud and $15 an ounce for other parts of the plant, like the trimmings of leaves and stems. A total of 880 pounds of bud and 806 pounds of trim was sold in February. All told, Alaska has collected $8.25 million from the excise tax since legal sales began in October 2016. Since sales began, taxes have climbed slowly and unevenly, with some months trailing behind others. In January, for the first time since legal sales began, Alaska's commercial cannabis growers paid more than $1 million in state taxes. For March, state officials are estimating more than $1 million in revenue. "The tax increase in March is not attributed to anything in particular. However, marijuana celebrations are said to occur on April 20th, perhaps sparking retail stores to stock up on product," Mazzei wrote in an email. In February, for the first time, Anchorage matched the number of Fairbanks growers, with 17 in each community. Five growers paid taxes from North Pole, and six Wasilla growers paid taxes. The rest of the tax payers were scattered throughout the state. Most of the money is paid in cash. Over $6 million has been processed by state employees using a single cash-counting machine. From October 2016 to the end of February, marijuana stores sold $73.47 million in cannabis products to the public, according to Alcohol and Marijuana Control Board director Erika McConnell.